Bournemouth midfielder Harry Arter dedicated Saturday's victory over Manchester United to his family following the death of his daughter. Arter, 25, and his partner lost their child at birth in midweek. 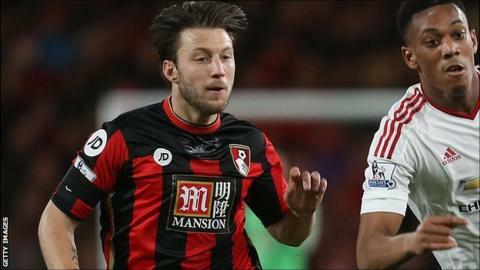 Despite his loss, Arter played for 86 minutes as the Cherries added to last Saturday's 1-0 win over Chelsea. "I just felt coming in and trying to take my mind off things would make it a bit easier. My family would want me to play," Arter told the club website. Republic of Ireland international Arter was close to tears after being booked after 84 minutes, and was substituted two minutes later before being embraced by his manager Eddie Howe at the full-time whistle. Howe said the player "handled himself with real dignity throughout the process". "While people maybe grieve in their own way, I found it easier to come in and play and try and do everyone proud," Arter said. "I said before the game that one reason I wanted to play was to dedicate the game to everyone associated with my family - my family that are here and not here." Arter also paid tribute to his team-mates and staff at AFC Bournemouth. "The support of everyone at the club is why I felt like I wanted to play as well," he said. "They have been unbelievable for me this week and made things a tad easier. I am sure my partner at home will be really proud too. It's a game that we can look back on with a lot of pride." Windy weather and Man Utd's answer?